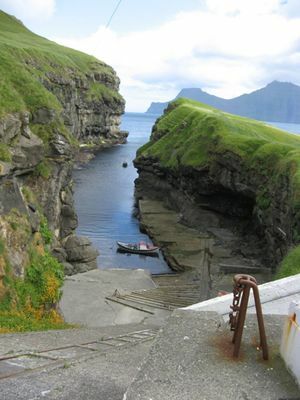 The small picturesque settlement Gjógv (Gorge) on the north of the island Eysturoy has become a popular place for tourists to visit in recent years. The village was named for a 200-metre (650 ft) long sea-filled gorge that runs north to sea from the village. The village is close to Slættaratindur the highest peak on the Faroes. Hiking over the hills to Ambadalur northwest of Gjógv will yield a wonderful vista out over the sea stack called Búgvin. At 188 metres it is the tallest sea stack in the Faroes. Debesar Shop and Café, where it is possible to buy fx. handmade Faroese jewelery and traditional coffee or tea with cake. This page was last edited on 7 January 2011, at 21:57.